Appedit is developed by Rich Pulver in the time Metaframe XP was there. But the program is still working on Metaframe 3.0 and Presentation Server 4. Writing this article I'm using Citrix Presentation Server 4. Many freeware tools do not have prerequisites because it just are stand alone executables. AppEdit however needs to installed using the MSI file and also have a prerequisite. On the server running AppEdit you need to have the Citrix SDK installed on it. The Citrix SDK can be downloaded (after registration on the CDN network) here. I have tested it with SDK 4.0. After installation of the two installation files of the Citrix SDK you can install AppEdit. During the installation you only need to specify the destination location of the application. Both the installation as the SDK do not require a reboot, so just after installation you can start using the program. When the program is started (it's not really quick) you have three tabs. With Remove All Apps you can select the server(s) where you want to remove all the server(s) out of the server specified in the Published Applications. In this way you can remove a server out of all the application within a single click for example taking the server in maintenance or out of the business. You can select multiple servers in one action. When you remove the server from the published applications the program is creating a small text file into the specified working directory. When you bring the server online (after maintenance) you can using "Add Apps to server" button to publish all the applications again on that server(s). The next tab is Remove Selected Apps. Within this tab you can select one server. From this server the current Published Applications are shown and you can select one or more applications that should not be published anymore on this server. When performing this action the removed applications are also stored in a text file and in the same way as at Remove all Apps can be added again (although this is not very logical for me). When you removed one app and would like to remove another one from the same server this is not possible because the application does not allow this. Probably the application is checking the availability of the text file and because it's already there you can remove the next application. For me it would be more logical that applications removed using this tab are not stored in a text file, so you can remove more applications in more steps. Besides you could easily add an application back to the server using the last tab. The last tab called Add applications is what the name applies. 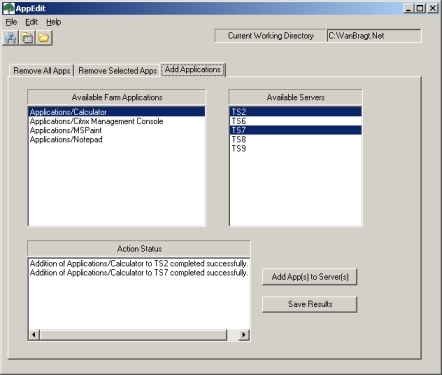 With this tab you can add already defined Published Applications to one or more servers. I think this option is probably the most used one. If you add one or more server to your farm this is easiest way to publish the applications on this server or servers. AppEdit is very easy tool to simplify some of your tasks concerning Published Applications. Personally I find the Remove All Apps (for taking a server offline) and Add Applications (when adding one or more servers to your farm) the most useful. menu do not have added value. AppEdit can be found here.